In this day and age, you cannot just say you traveled to this place or that place since people would typically ask for pictures. “Pictures or it didn’t happen,” so they say. The main reason for that is it now very convenient to take pictures, using multiple devices, and one of which is the best selfie drone. Taking travel pictures and travel selfies and posting them on social media has now become a trend. Some people even make a living showing the world where they have been and what their experiences were like. These people are called social media influencers and travel bloggers. Social media influencers or not, it is important that one takes great travel pictures and videos for posterity’s sake. It can be considered a social responsibility to document these travels and adventures and show if not this generation, but the future generations how these national treasures and heritage sites look and feel during a specific period. The questions now are, “Which drone takes the best pictures and videos? Which is more portable? Which is the most affordable? Below, three selfie drones are compared and contrasted. At the end of the article, the most awesome selfie drone is revealed. This foldable selfie drone from Holy Stone has a lot of wonderful features. It uses flexible ABS plastic aerofoil and fuselage that makes it durable and portable without compromising its performance. This material also ensures that should an accident take place, no one will be seriously injured. 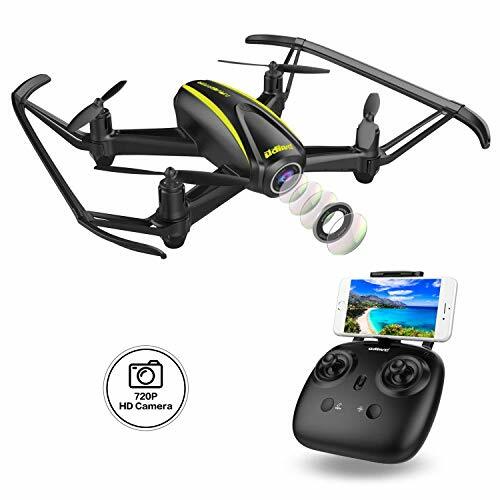 Since it is a selfie drone, it has an HD camera that has 1280 x 720P video recording mode and is built-in together with 6-Axis Gyro 4CH 2.4GHz. Other features include a transmitter range of 50 to 70 meters, WiFi transmission range of 30 meters, and playing time of up to nine minutes. It also has four-speed settings making it perfect for both beginners and experienced flyers. Holy Stone HS 160 comes in at a weight of 2.93 ounces, meaning, it does not need to be registered with the Federal Aviation Administration (FAA). It runs using a 3.7V 500mAh battery, and each package comes with two batteries, a USB charger, two spare controller sticks, a phone holder, four spare propellers, a screwdriver, and a dust-proof bag. 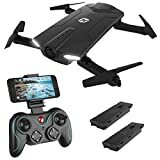 The Holy Stone HS160 Shadow FPV RC Drone is a portable and easy-to-use selfie drone that is perfect for summer trips. With its user-friendly design, you can surely operate this even if it is your first time to use a drone. The main feature of the EACHINE drone is its one-hand controller; unlike most drones that need to be controlled using two hands, this one takes traveling while taking selfies to the next level. One can be holding a bag or a coffee mug with his one hand while taking a picture with the other hand. You can also do away with the small controller since EACHINE drone also has an app that allows the user to control using their mobile device. It has seven minutes flying time with its 3.7V 500mAh Li-Po battery that charges within 70 minutes. It comes in a size dimension of 17.8 x 18 x 3.2 cm when the propellers are spread out and 14.6 x 6.7 x 3.2 cm when folded. The package comes with a protective case together with the normal inclusions. This device even has an emergency stop button, which is very useful to avoid accidents and crash landings. Additionally, the mobile app has a lot of different features, such as a gravity sensor and lens reverse, that makes this product more enjoyable and exciting to use. Convenient for anyone to use and carry around. The EACHINE Drone with Camera is a selfie drone that matches the lifestyle of travelers who love to carry a lot of things since it can be operated with one hand. Since it has a short battery life, this is suited for those who only take selfies once in a while they travel, unless, of course, you plan to buy a spare battery. OPTIMIZED 2MP 120° FOV FPV WI-FI CAMERA: The DROCON NAVIGATOR will be your eye in the sky, providing you with real-time HD footage direct to your mobile device. Together with the advanced altitude hold mode, you can take awesome selfies and catch every moment of your aerial journey in detail. ALTITUDE HOLD MODE FOR BEGINNERS AND KIDS: The altitude hold mode lets you fly the drone at a specified altitude and it utilizes a barometer to achieve this. This feature means you can fly or hover the drone at a fixed height, making the drone much more suitable (not to mention fun) for beginners and kids. ONE KEY TAKE-OFF AND LANDING: This function allows a user of any level (beginner, intermediate or expert) to take-off and land like a pro! Simply press this button and watch the drone seamlessly land or take-off at your desire. HEADLESS MODE PERFECT FOR NEW USERS: Are you worried about controlling or losing the drone?? With the headless mode, you can completely avoid these problems as the direction of the drone will always be the same as the controller. ONE-YEAR WARRANTY GUARANTEE: If you encounter any problem with the drone, need spare accessories or some advice about flying the drone, feel free to contact us directly. Backed by a 12-month warranty and with our Customer Care Team on standby, you can purchase from us with confidence, so hit 'Add to Cart' now! This drone has a 120-degree lens, 720P HD camera, 3D VR view as well as a barometer altitude mode to avoid shaking. It has a maximum flight time of seven minutes when fully charged. Just like the other two above, this one has a smartphone control mode, so the user can see shots being taken real time as well as can control the camera settings. It also has the “Go Home” button when the drone has gone too far or is difficult to locate especially in crowded areas. DROCON U31W Navigator also has an alarm for when it goes out of range or when the battery is running low. This alerts the user to bring it back before it gets lost or runs out of battery and crash landing somewhere. It has a dimension of 18.3 x 19.8 x 4.3 cm and weighs 85 grams. It can support SD memory cards, but it is not included in the package. 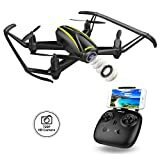 This selfie drone might not be as light as the two models, that this is perfect for those who have shaky hands, as it has an air pressure altitude mode. The best selfie drone is not only something that takes the best pictures but is also very portable so that you can just toss it in a small bag. That said, both Holy Stone’s and EACHINE’s are foldable, making them better than the DROCON. However, when you consider budget, the Holy Stone’s cost twice as much as the two other options; hence, the EACHINE Drone with Camera is the device that we highly recommend, especially for those who are on a tight budget.